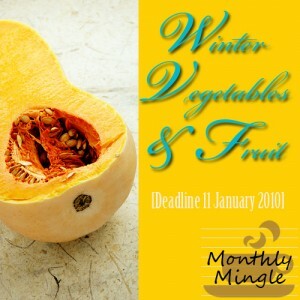 A month earlier, I announced Monthly Mingle for Winter Fruits and Vegetables. I’m kicked with the response – 34 entries from 32 bloggers of 13 countries. Read on for a sumptuous winter treat. Since I started food blogging back in April 2008, Meeta had been an inspiration with her posts and photographs quality. So, when she agreed to let me to host her already famous monthly blog event – Monthly Mingle, I got excited. Meeta even designed the logo for the current event. Meeta, can’t thank you enough. Choosing the event theme wasn’t easy. I being the 23rd blogger to host this event, you can pretty much assume that almost all types of food and accompaniments have been covered earlier. This being Winter, so thought of a very simple theme – Winter Fruits and Vegetables. I’ve tried to group the entries into 5 categories – Soups, Bakes, Fruits, Sides and Others. Due to post length, I’ve split the round up into two posts. Part 1 will talk about Soups and Bakes. A potato and carrot soup from Divya of Dil Se, just perfect for the chilly winter evenings. Tigerfish of Teczape- An Escape of Food had something else in mind. She thought of a good heart-healthy seasonal soup for winter. Best way to use the seasonal produces in her Kale Winter Vegetable Soup with Salmon and Tofu. Aoife of The Daily Spud found a little hope to cope with the ice cold winters of Ireland with this wonderful Ukranian soup called Borscht, which she learned from a cookery lesson in Moscow school cafeteria. PJ of Ginger & Garlic has a thick and spicy soup to share with us, the name Parsnip soup with kale and roasted garlic says it all. Sarah of Maison Cupcake, UK has a healthy and ‘immediate’ soup to cater in this winter, the Immediate Butternut Squash and Chestnut Soup is good deal to pamper your taste buds. Though that’s not what we mean when we say ‘soup’, but the Mango Cauliflower Rasam from Ruchika of Ruchika Cooks is a must have for all of us who would like to drink healthy this winter. With winter, comes Christmas bells and with comes the delicious Christmas cakes. Happy Cook of My Kitchen Treasure has something special to share, it’s a Cranberry upside down cake. Joanne of Eats Well With Others took a new year resolution of not bringing back breads to home, the only breads allowed inside her kitchen are the ones prepared solely by her. Here’s her first step. She sends an amazing Fried Eggs on Toast with Cheddar and Avocado. This French lady, Gaelle of WhatAreYouFeedingYourKidsTheseDays is happy to serve her family with a simple yet delicious dish, the Gratin of Baked Winter Vegetables. It’s an adapted version of a very traditional French dish that was perfect for the freezing temperatures of Philadelphia: a Gratin Dauphinois (baked potatoes). Meeta of What’s For Lunch, Honey? sent a lovely looking Kohlrabi Turnip Gratin, never thought turnip would look so tempting. Saveur from The Taste Space has a wholesome dessert to serve – Apple Cranberry Oat Crumble. Nandini of Usha Nandini’s Recipes dared to add some oranges to her biscuits, and look what she has got – flower shaped Orange Biscuits (note the beautiful orange tinge). nice roundup.. waiting for my entry to show up! Sudeshna thank YOU for being such a grand hostess and helping with the MM. A lovely roundup and I am looking forward to visiting each scrumptious one. .-= Meeta´s last blog ..Bollywood Cooking: Chickpeas with Spinach – Channa Palak =-. Thank you for the wonderful round-up! They all look like tasty dishes to try. The round up looks wonderful, with so many wonderful creations. Waiting fo the second part too. Love all of them, difficult to choose one. Thankyou for the roundup. .-= Happy Cook´s last blog ..My Name and a Chocolate Dipped Madeleines =-. .-= Daily Spud´s last blog ..Fave New World =-.